Modi also said when Pakistan is exposed in front of the world, some people not only lose sleep but start speaking in its favour and compete to become its hero. Some people lose their sleep when India hits back at terrorists, Prime Minister Narendra Modi said in Amroha on Friday while launching a broadside against opposition parties who he claimed were putting the lives and future of the people in danger. 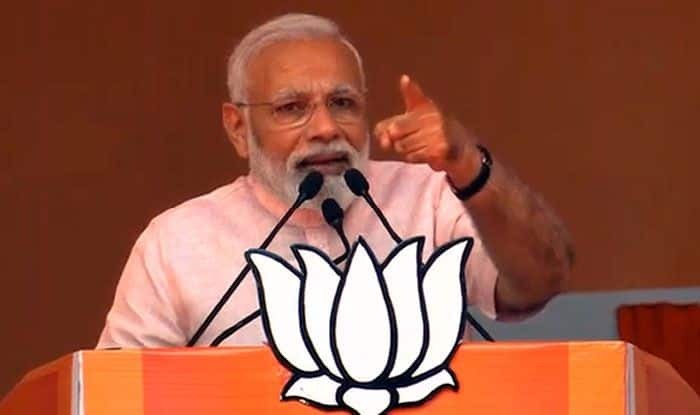 Addressing a rally in this Uttar Pradesh town ahead of the 2019 Lok Sabha elections beginning April 11, the prime minister said “some people” did not like the fact that terrorists were being given a reply in their own language. “After the terrorist attack, should I have remained silent or attacked,” he asked the gathering, referring to the February 14 terror attack on a CRPF convoy in Pulwama. “Terrorists are being given a reply in their own language… This is not liked by some people who lose their sleep when India hits back,” he said. When Pakistan is exposed in front of the world, “these people” start speaking in its favour and there is “competition among them to become its (Pakistan’s) hero”, Modi said. “Be it the Congress, the SP or the BSP, they have put your life and future in danger,” the prime minister told the crowd gathered in the town with a sizeable Muslim population. The governments of ‘Bua’ (Mayawati) and ‘Babua’ (Akhilesh Yadav) released terror accused and were kind to them, Modi alleged. “The links of these attacks go very far and when our security agencies nab the accused, due to vote bank politics, Bua and Babua governments used to set them free and were kind to them,” he said. “Some forces are dividing the country and creating fissures on the basis of caste. The people of UP have given befitting reply to such forces in 2014 and 2017. The Congress even tried to humiliate Baba Saheb Ambedkar and tried every trick to defeat him in elections. “Otherwise, the same party even did not let his photographs installed in Parliament. Can their sins be pardoned?” Modi said. He alleged that leaders like Yogendra Nath Mandal and Babu Jagjivan Ram were also ignored by the Congress which did not mete good treatment to them. The prime minister said he had not let the country hang its head in shame in the five years he had been in power, stressing that the country’s reputation and image were higher than it had ever been. “I would like to thank the government of UAE and people of UAE for honouring me with the Zayed medal…This is not an award given to Modi but to the Indian people,” he said. He said on Thursday that he accepts the prestigious ‘Order of Zayed’ conferred on him by the United Arab Emirates with utmost humility. “A wave, which is found in the country, is also seen in Amroha. I bow before you for the way in which you helped this ‘Chowkidar’,” he said.